SUPER PC iVu9s-HDMI | Stand Alone Video Wall Controller | Combine up to Nine 1080p Displays! SUPER PC Multiple Monitor Computers and Display Technology Superstore! SUPER PC iVu9s-HDMI | Stand Alone Video Wall Controller | Combine up to Nine 1080p Displays! 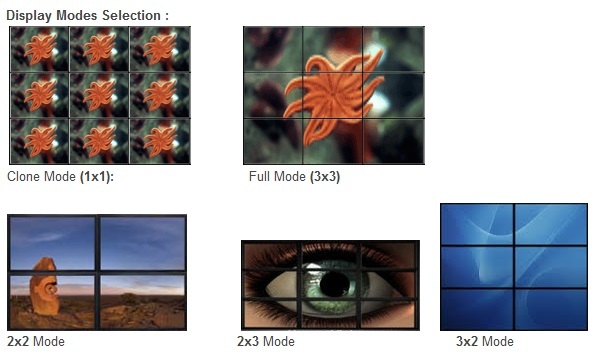 Easily Combine 4, 6, or 9 screens into a video wall array! The Most Affordable and User Friendly (3 x 3) Video Wall Controller Available!! Ideal for Exhibitions, Control Rooms,Medical Image Review, Satellite Imagery and Signage Display Solutions. The high-resolution video controller iVu9s enables 1 x high resolution input up to 1920x1080(HDMI and outputs 9 x HDMI outputs scalable up to 1920x1080 per screen. The multiple output design enables large-screen display solutions through only one video controller, providing a cost-effective solution. The OSD keypad located at the front enables an easy-control interface while all the video outputs and power located at the rear brings the advantage of convenient cabling. The iVu9s video controller is designed to drive LCD, DLP screens, video wall cubes and projectors, making it perfect for all kind of display applications. Connect a Tablet or Smart phone directly to the iVu9s Video Wall Controller for instant display on a huge video wall. No special hardware is required, only a high resolution HDMI output from the device to the video wall controller. The video wall controller tiles together a group of small and inexpensive LCD panels to produce a large video screen. The iVu9s video wall controllers can be connected to almost any monitor or TV screens that supports HDMI (or DVI input via adapters). Monitors can be chosen according to budget and application needs. The HDMI input source can be from iPad, Tablets, mobile Phone, PC's, Laptops, DVD, Camera, etc ... DVI to HDMI adapters can be used for DVI input or output enabling more flexibility. Just show it on the huge screen. Show off your ideas, photos, videos and more on your video wall. Up to 1920x1080 pixel input and scalable up to 1920x1080 output per display. On Screen Display/Remote control functions for selecting; Display mode, Output resolution; Border mask enable/disable and frame wideness adjustment. Bezel mask or screen border adjustment, this is quite an important function, normally the display will be 'staggered" from screen to screen due to the use of conventional LCD/Plasma displays, but with this function you can adjust the display to be seamless, e.g. mask-out the screen bezel enabling a visually seamless display. Easy-DIY to install and control the video wall or multi-screens either from a PC, Laptop or remote control unit. Multiple units can be used for larger screen configurations, e.g. by installing a dual channel graphics card into a PC then two iVu9's can be connected to enable a 6x3 video wall or multi-screen display or one iVu9s can be cascaded to four further units to enable a 16x16 videowall / multiscreens. EMS video wall controllers are as simple as plug and play. Users can simply connect their video source/player and video wall displays to the iVu9s video wall controller via HDMI, and the system will be setup with no complicated procedure required. The video wall controller can automatically detect the default settings and support up to nine displays via HDMI.